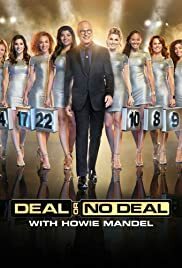 Deal or No Deal is the American version of the international game show of Dutch origin of the same name. The show was hosted by Howie Mandel, and premiered on December 19, 2005, on National Broadcasting Company. The hour-long show typically aired at least twice a week during its run, and included special extended or theme episodes. The show started its fourth season on August 25, 2008, after NBC's coverage of the 2008 Beijing Olympics. A daily syndicated half-hour version of the show debuted on September 8, 2008 and continued for two seasons. The game was primarily unchanged from the international format where a contestant chooses one briefcase from a selection of 26. Each briefcase contained a cash value from $.01 to $1,000,000. Over the course of the game, the contestant eliminated the other cases, periodically being presented with a "deal" from The Banker to take a cash amount to quit the game. Should the contestant refuse every deal, they were given the chance to trade the original case for the only other one left in play, and won whatever money was in the chosen case. Special variations of the game, including a "Million Dollar Mission" introduced in the third season, were also used, as well as a tie-in with a viewer "Lucky Case Game".